Do you want to show to your friends that you care about them or your girlfriend how much you love her? Give them gifts which they can display directly on their profile! You can give gifts to whomever you want from their blog or profile ! How do you give a gift? - Log-in to your Skyrock.com account. - Head to the blog or profile of the person you wish to give the gift and click on 'Give a gift' in the left-hand column. The person receives the gift in their gift inbox (found in the 'Manage profile' section) and as soon as they accept their gift it's displayed on their profile! Why not take a look at the Gift catalogue right away?! How does it work ? It's really simple ! 1/ Go to your profile Settings. 2/ Make sure to tick the 'My relationships' box under 'Show' and under 'Enable' the 'relationship request' box. 3/ Go to the person's profile, that you would like to be in a relationship with and click on 'More option' underneath the avatar and 'show "in a relationship"'. A message will be sent to the user in question and they'll decide whether to accept your request or not. If they accept, a new 'love' section will be installed on both of your profiles. Make sure you make the right choice ! You cannot love several people at the same time. 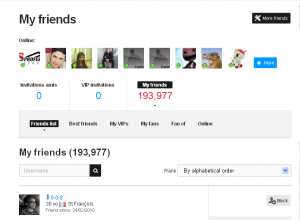 - Access your friends, best friends, VIP's, your fans, your online friends and the blogs you are fan of. - Easy, one-click access to the Profile/Blog of your best friends. 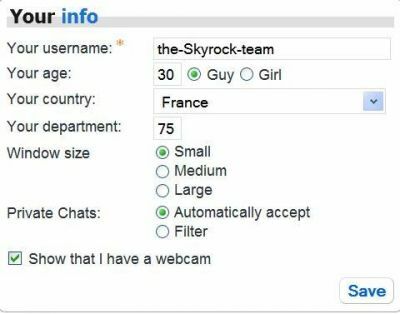 Don't forget to add the Skyrock-team to your best friends! 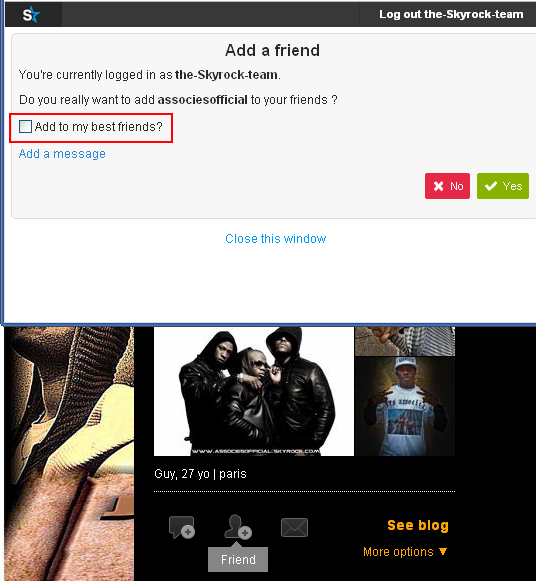 Check out our latest function which allows you to directly add a Skyrock member to your best friends. If they accept, they'll appear immediately in your list of best friends. You can also send them an automatic message to let them know they've been added to your list of bests! Personalize the wallpaper of your blog with an image of your choice. Just log-in, head to 'Settings > 'My blog > 'Skin' > Personalize and click on the 'Add' button in the 'Background image' section. Then simply upload the image of your choosing and make sure you click on 'Save'! Do you, like thousands of other members, go on Skyrock Chat every day ? Now you don't have to unplug your webcam if you don't want to people to know you have one. Before you enter the chatroom just untick the box "Show that I have a webcam". If you want people to see that you have a webcam, just leave it ticked! 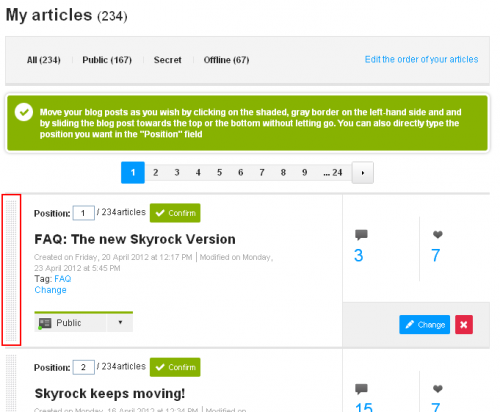 Did you know you can decide on the order you want your blog posts to appear in? 3/ Now, go to 'POST', click on 'Edit the order of your articles'. After following these steps you are free to alter the order of your posts as you wish by clicking on the shaded, gray border on the left-hand side and and sliding the post up or down. You can also directly type the position in the 'Position' field - But make sure you confirm all your changes! Tips&Tricks: Show some love to your best friends! Putting friends into your "Best Friends" list allows them to appear on top of the friend lists in your Blog and Profile. You can have up to a maximum of 100 Best friends! The "best friend" you want to add must already be in your standard friend list. To change your best friends, head to the Best friends tab and remove contacts by clicking on the red cross.